Some of us are just not that lucky to have a large, airy kitchen, but does that mean we should despair? Of course not! Although we have to be realistic and accept that there are certain limitations imposed on us, we can still see them as challenges that need to be overcome. 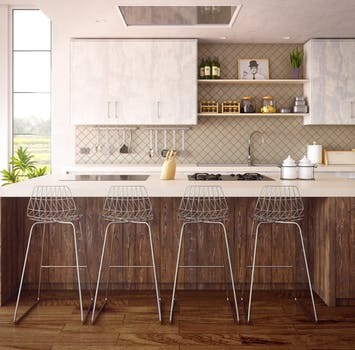 So, if you’ve just moved to a place with a “space-challenged” kitchen or you’ve had enough of spending time in a claustrophobic environment, you need to know that there is an answer to your problem and it’s relatively straightforward – renovation. A smaller kitchen might mean that you gain more space elsewhere. Even if that’s not the case, you should know that the smaller the kitchen, the less expensive it is to remodel and furnish. So, if you’ve decided to do something about making the most of the limited space available, make sure you approach the project in the right mindset. We all know that confined spaces don’t benefit from darkness, which is why you need to avoid dark colours and opt for bright ones, which will add a touch of space, since they reflect a lot of light. This refers to all elements, from walls and floor tiles to cupboards. Forget about having a multifunctional space where you can prepare and eat food, entertain guests, have the kids do their homework etc. A small kitchen should focus on its main purpose and that is preparing food. The design should make it possible for you to use it for this role and cater to other needs only if it’s not too inconvenient. It may not be wise to stick to a 12-foot-long counter-sink combo if your kitchen is tiny. Instead, try to use the corner, for example, to store your appliances or ingredients you need often, while sequestering the sink in its own area. Remember that you don’t have much room to waste. While you’re remodelling your kitchen, you may need to move some appliances around. That can be a problem, since you might need your remodeller to move the installations as well. Whatever you do, make sure you safely connect gas, since you don’t want to risk any leakage. Probably the biggest problem with kitchens with limited space is storage. We all know how important it is to have all the pots, ingredients and utensils at hand when preparing food, so we need to make space for them in the kitchen. One of the ideas is to install narrow filler cabinets with sliders, where all those smaller items can be kept. Also, consider making pantry cabinets that go all the way up to the ceiling. It may not be the most pleasing sight, but practicality and functionality have to take precedence. No matter how much you may like small tiles, they make any space look even smaller and more cramped. That’s why you should go for larger ones, which make the kitchen larger and airier. The only exception might be galley kitchens, which may look too odd because of their narrow centre floor. As you can see, there is a lot to be gained from a kitchen renovation, provided you do it properly with a kitchen renovation company. With so many ideas shared online, you really shouldn’t have problems finding inspiration for your project, though your budget may impose strong limitations. However, since everyone needs a functional kitchen, regardless of its size, there is no reason why you shouldn’t explore the option of making the most of the space available.